This is the first in a series of family lineages. These reports are the culmination of over twenty years of family history research. 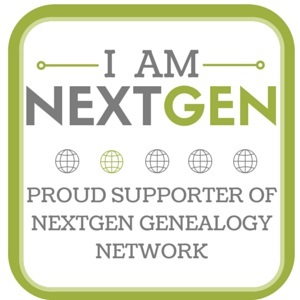 As traditional genealogy intersects with genetic genealogy, it is important to know all of the branches in a family tree, including the female descendants, daughters as well as the sons. 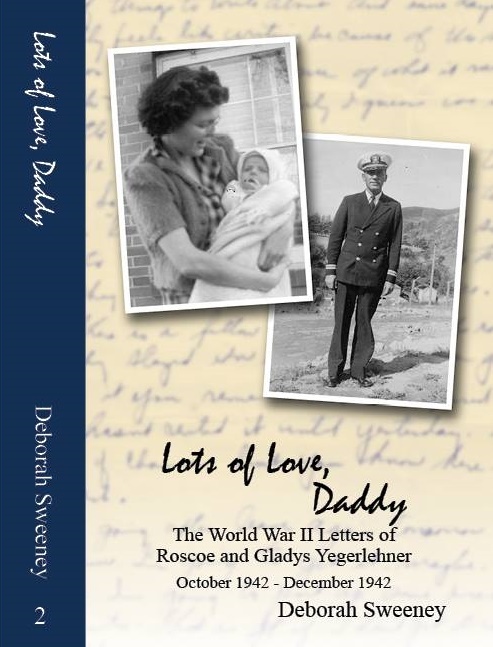 In the past, surname books often overlooked females once they “left” the family. In the case of Elijah’s family, the bulk of his descendants are through his three daughter’s lines: Mary, Belle, and Fanny. Researchers attempting to find DNA relatives may overlook the Laughead surname. I chose to publish Elijah’s family first, even though he was not one of my direct ancestors. He and his children repeatedly crisscross my direct line. Elijah is a double cousin to me. His mother was my 4X great grandmother, Ruth Wilcoxon (Higgins) Harding Lawhead while his grandfather, James Laughead, was my 5X great grandfather. At least two of his children married back into my line of descent. Elijah’s daughter Belle married the older half brother of my great grandmother, Emma H. (Lawhead) Foster, while Elijah’s son George married the granddaughter of my 3x great grandfather, Joseph Lawhead. Several of these descendants would theoretically share higher amounts of DNA than predicted because of the various intermarriages. This is a work in progress. Please contact me with any corrections or if you would like to see further documentation. This report was not completely footnoted at the time of its original publication. The purpose of this report was to document the descendants, not necessarily tell individual stories. Future revisions will address these in greater detail. The surname Laughead is spelled phoetically as Lawhead. Some branches of the family chose one version of the name over the other in the 20th century as spelling became formalized. The surname was never Ladd or Lloyd. This confusion is a result of the American soundex system which catalogs Ladd and Lawhead together. Elijah Griffith3 Laughead (John2, James1), born 1 October 1840 at Marietta, Washington County, Ohio; died 28 July 1911, Hutsonville, Crawford county, Illinois. He married (1) on 13 October 1860, at Lawrence County, Indiana, Mariah McNabb, daughter of Manley and Mary Margaret (Fawbush) McNabb. Mariah was born 6 November 1841, Lawrence County, Indiana; died 21 March 1907, Hutsonville, Illinois. Elijah married (2) on 2 October 1909, at Crawford County, Illinois, Ella M. (Jeffers) Alberty, daughter of Abraham Jeffers and Nancy (Hamilton) Jeffers Dicks, and widow of William H. Alberty. Born 9 October 1849 in York, Clark County, Illinois, Ella died 4 November 1938, Detroit, Michigan. Elijah and Maria were buried at Hutsonville Cemetery, Hutsonville, Illinois. Ella was buried at Woodlawn Cemetery, Detroit, Michigan. 3 ii. JOHN M. LAWHEAD, born 22 March 1863, Indiana; married Martha J. [-?-] Watson Pinkstaff and Winnie M. Vance; died 4 September 1940, Melrose, Clark County, Illinois. + 4 iii. BELLE RUTH LAWHEAD, born 2 February 1865, Mitchell, Lawrence County, Indiana; married James Francis Lawhead; died 7 January 1947, Flat Rock, Crawford County, Illinois. + 5 iv. GEORGE W. LAUGHEAD, born 24 August 1866, Indiana; married Louisa Delana Jennie Lawhead; died 10 May 1934, Uniontown, Fayette County, Pennsylvania. + 6 v. ALBERT SANFORD LAWHEAD, born May 1871, Greencastle, Indiana; married Anna Belle Ayers; died 14 May 1948, Robinson, Crawford County, Illinois. + 7 vi. FRANCIS E. “FANNY” LAWHEAD, born 17 September 1872, Greencastle, Indiana; married William Watson; died 31 January 1940, Terre Haute, Indiana. 8 vii. CHARLES LAWHEAD, born 1874, Indiana. He was married and divorced between 1900 and 1910. He died after his father in 1911. No further information. + 9 viii. ALDOLPHUS NEWTON LAWHEAD, born 16 September 1877, Mitchell, Indiana; married Lana L. Myers and Mary Elizabeth Plew; died 17 February 1958, Hutsonville, Illinois. 10 WILLIAM2 THATCHER ALBERTY, born 5 February 1873, Hutsonville, Illinois; married Clara Belle Wilkey; died 1 June 1926, Hutsonville, Illinois. 11 NORA ETHEL ALBERTY, born 13 December 1883, Illinois; married Irey S. Brodbent; died December 1966, Detroit, Michigan. Mary Jane4 Lawhead (Elijah3, John2, James1), born 17 July 1862, Greencastle, Putnam County, Indiana; died 16 January 1929, Springfield, Sangamon County, Illinois. She married on 20 April 1878, Lawrence County, Indiana, Alexander Stevens, son of Jeremiah and Susan (Painter) Stevens. He was born 15 June 1857, Indiana; died 16 March 1934, Indianapolis, Indiana. Alexander was likely first married on 11 December 1873, Lawrence County, Indiana, to Elizabeth Barnett. Mary and Alexander were buried at Mitchell City Cemetery, Mitchell, Lawrence County, Indiana. + 13 ii. NORA BLANCH STEVENS, born May 1882, Lawrence County, Indiana; married Fred Fordyce; died September 1962. + 14 iii. OSCAR ROBERT STEVENS, born 11 March 1884, Mitchell, Lawrence County, Indiana; married Helen Louise Gleason; died 30 May 1956, Lima, Ohio. + 15 iv. LAWRENCE STEVENS, born 27 September 1885, Mitchell, Lawrence County, Indiana; married Selma Hamby; died 8 March 1967, Birmingham, Jefferson County, Alabama. 16 v. IDA STEVENS, born 9 April 1887, Indiana; married Martin Joseph Conroy; died June 1967. 18 vii. BERTHA S. STEVENS, born 15 June 1891, Indiana; married Edmund John Burgess and Elmer Frank Foster; died November 1970. + 19 viii. CARRIE E. STEVENS, born 1 April 1893, Indiana; married Lawrence William Schweiss; died 22 September 1991. + 20 ix. JOSEPHINE ETHEL STEVENS, born 16 February 1894, Mitchell, Lawrence County, Indiana; married Hascus L. Gallahon and Henry Long; died after 1961. 21 x. FRANK DELBERT STEVENS, born 2 October 1897, Mitchell, Lawrence County, Indiana; married Edith F. Hagen; died 19 January 1961, Decatur, Macon County, Illinois. 22 xi. FRED STEVENS, born December 1899, Lawrence County, Indiana; died 20 October 1900, Lawrence County, Indiana. The primary cause of death was gastroenteritis with exhaustion as a secondary factor. 23 xii. EMMA FRANCES STEVENS, born 17 July 1900, Mitchell, Lawrence County, Indiana; married James Willis Lindsey, Lawrence Ellis and Milburn Nolan; died 1963, Springfield, Sangamon County, Illinois. John M.4 Lawhead (Elijah3, John2, James1), born 22 March 1863, Indiana; died 4 September 1940, Melrose, Clark County, Illinois. He married (1) on 27 November 1912, Knox County, Indiana, Martha Jane (Williams) Watson Pinkstaff, daughter of Alfred and Sarah (Mauzey) Williams, as her third husband. She was born 28 September 1846, Fleming County, Kentucky; died 20 November 1921, Terre Haute, Indiana. She was married (1) on 18 October 1866, Fleming County, Kentucky, Samuel Watson, son of Henry and Lavina (Harman) Watson. He was born 18 August 1842, Fleming County, Kentucky; died 1 April 1890, Hutsonville, Crawford County, Illinois. Martha married (2) on 11 November 1891, Crawford County, Illinois, Francis Marion Pinkstaff, son of John and Susanna (Foley) Pinkstaff, as his second wife. John married (2) about 1924, Winnie May Vance, daughter of John C. and Celestia N. (Schultz) Vance. She was born 16 August 1882, Illinois; died 30 December 1972, Marshall, Clark County, Illinois. Winnie was buried at Marshall Cemetery, Marshall, Illinois. 24 WILLIAM A.2 WATSON, born 20 March 1868, Kentucky; married Francis E. Lawhead (see #7 for more on this line); died 24 March 1935, Terre Haute, Indiana. 25 LAWSON WATSON, born September 1871, Missouri; died 26 April 1942, Anna, Union County, Illinois. Lawson spent many years at the Anna State Hospital for the Insane. He did not marry. 26 EMMA JANE WATSON, born 28 September 1878, Stanford, Vigo County, Indiana; married Henry Kelly Steffey; died 8 October 1940, Bond, Lawrence County, Indiana. Belle Ruth4 Lawhead (Elijah3, John2, James1), born 2 February 1865, Mitchell, Lawrence County, Indiana; died 7 January 1947, Flat Rock, Crawford County, Illinois. She married on 4 July 1884, Clark County, Illinois, James Francis5 Lawhead (James4, Joseph3, James2, James1), son of James H.4 and Margaret A. (Rea) Lawhead. James was born 9 June 1862, Greene County, Indiana; died 26 February 1912, Hutsonville, Crawford County, Illinois. Belle and James were buried at Hutsonville Cemetery, Hutsonville, Crawford County, Illinois. + 27 i. HOMER L.5 LAWHEAD, born 22 April 1885, West York, Crawford County, Illinois; married Lulu M. Parr; died 14 May 1959, Crawford County, Illinois. + 28 ii. MARTHA LAWHEAD, born 29 October 1886, Crawford County, Illinois; married Everett Bradford McGovern; died 29 January 1969, Robinson, Crawford County, Illinois. + 29 iii. GRACE L. LAWHEAD, born 19 March 1888, Crawford County, Illinois; married James Calvin Raley; died 7 March 1953. 30 iv. ERNEST LAWHEAD, born 12 March 1890, Crawford County, Illinois; married Eldora “Dora” Melzenia Kirk; died 15 December 1918, Robinson, Crawford County, Illinois. + 31 v. MATHIAS “MACK” REED LAWHEAD, born 7 July 1892, West York, Crawford County, Illinois; married Vera Opal Wilkin and Ruth Bell Kimball; died 28 August 1975, Robinson, Crawford County, Illinois. + 32 vi. HENRY J. LAWHEAD, born 15 September 1895, West York, Crawford County, Illinois; married Beatrice Alberta Henderson; died 12 February 1964, Crawford County, Illinois. + 33 vii. HARRY LAWHEAD, born 23 December 1897, Crawford County, Illinois; married Gladys Opal Brittenham; died 31 January 1966, St. Louis, Missouri. + 34 viii. EDWARD OTEY LAWHEAD, born 25 April 1900, Crawford County, Illinois; married Bessie Ducommon; died 18 August 1974, Bedford, Lawrence County, Indiana. + 35 ix. DENNIS LAWHEAD, born 3 October 1902, Robinson, Crawford County, Illinois; married Leola Skaggs; died 3 January 1986, Robinson, Crawford County, Illinois. + 36 x. FRANK LAWHEAD, born 24 August 1904, Crawford County, Illinois: married Reba F. Kibler; died 17 October 1888, Robinson, Crawford County, Illinois. 37 xi. INFANT LAWHEAD, born and died before 1900, Crawford County, Illinois. No further information. George W.4 Laughead (Elijah3, John2, James1), born 24 August 1866, Indiana; died 10 May 1934, Uniontown, Fayette County, Pennsylvania. He married on 19 November 1894, Knox County, Indiana, Louisa Delana Jennie5 Lawhead (John4, Joseph3, James2, James1), daughter of John W. and Elizabeth A. (Abrams) Lawhead. She was born 15 February 1873, Edwardsport, Knox County, Indiana; died 12 April 1959, East Huntington, Westmoreland County, Pennsylvania. George and Jennie were buried at the Old Frame Cemetery, also known as the Oak Hill Baptist Cemetery, Fayette County, Pennsylvania. + 39 ii. PAUL RAYMOND LAUGHEAD, born 13 February 1898, Indiana; married Anne Myrtle Roberts and Alice Townsend; died 30 July 1934, Barberton, Summit County, Ohio. + 40 iii. GEORGIA LUCILLE LAUGHEAD, born 13 July 1904, Brazil, Clay County, Indiana; married Louis R. Quartz; died 21 September 1968, Alverton, Westmoreland County, Pennsylvania. + 41 iv. ROBERT GRIFF LAUGHEAD, born 16 October 1905, Brazil, Clay County, Indiana; married to Pauline Kozel; died 16 July 1962, Uniontown, Fayette County, Pennsylvania. + 42 v. JOHN WESLEY LAUGHEAD, born 25 November 1908, Brazil, Clay County, Indiana; married Jane P. Hittie; died 13 December 1983, Chicago, Illinois. 43 vi. CLINT IRVIN LAUGHEAD, born 12 March 1913, Brazil, Clay County, Indiana; married Carrie Edith Berkshire; died 1 October 1954, O’Hara, Allegheny County, Pennsylvania. Albert Sanford4 Lawhead (Elijah3, John2, James1), born May 1871, Greencastle, Putnam County, Indiana; died 14 May 1948, Robinson, Crawford County, Illinois. He married on 24 November 1894, Crawford County, Illinois, Anna Belle Ayers, daughter of Samuel and Rebecca (Robinson) Ayers. She was born October 1874, Illinois; died 20 July 1956, Hutsonville, Crawford, Illinois. Albert and Anna were buried at the Hutsonville Cemetery, Hutsonville, Crawford County, Illinois. + 44 i. HENRY LESTER5 LAWHEAD, born 11 August 1891, Hutsonville, Crawford County, Illinois; married June Mary Hamilton and Blanche Olive Wicker; died 7 May 1965, Terre Haute, Indiana. 45 ii. ALMA C. LAWHEAD, born 13 March 1894, Hutsonville, Crawford County, Illinois; died 15 August 1895, Hutsonville, Crawford County, Illinois. Alma was buried at Hutsonville Cemetery. + 46 iii. OSCAR CHARLES LAWHEAD, born 29 January 1897, Hutsonville, Crawford County, Illinois; married Lola Lott, Elizabeth [? ], and Myrtle (Thomas) Robbins Hersey; died 13 January 1975, Miami, Florida. 47 iv. EDITH G. LAWHEAD, born 24 December 1898, Hutsonville, Crawford County, Illinois; died 20 February 1902, Hutsonville, Crawford County, Illinois. Cause of death was peritonitis and gastritis, at age 3 years, 1 month, 27 days. Edith was buried at Hutsonville Cemetery. Francis E. “Fannie”4 Lawhead (Elijah3, John2, James1) born 17 September 1872, Greencastle, Putnam County, Indiana; died 31 January 1940, Terre Haute, Indiana. She married on 22 October 1890, Crawford County, Illinois, William A.2 Watson, son of Samuel1 and Martha J. (Williams) Watson. He was born 20 March 1868, Kentucky; died 24 March 1935, Terre Haute, Indiana. Fannie and William were buried at Woodlawn Cemetery, Terre Haute, Indiana. + 48 i. ELMER5 WATSON, born 29 June 1891, Hutsonville, Crawford County, Illinois; married Lula Elizabeth Walker; died 24 January 1963, Terre Haute, Indiana. + 49 ii. NOBLE A. WATSON, born 27 April 1893, Hutsonville, Crawford County, Illinois; married Nancy Ann Cooper and Frona Elizabeth Shouse; died 5 April 1965, Terre Haute, Indiana. + 50 iii. VERNON ALFRED WATSON, born 15 August 1895, Graysville, Sullivan County, Indiana; married Nora Lena Callahan; died 4 August 1982, Terre Haute, Indiana. + 51 iv. ROY CARL WATSON, born 15 June 1897, Hutsonville, Crawford County, Illinois; married Marie Kaelin and Goldie Ann (Booth) Hudson; died 14 May 1965, Terre Haute, Indiana. + 52 v. REECE LORIS WATSON, born 5 December 1899, Hutsonville, Crawford County, Indiana; married Lulu Shouse; died 10 August 1964, Winchester, Randolph County, Indiana. + 53 vi. HAROLD GRIFFITH WATSON, born 14 April 1902; married Catherine Gerwick and Nellie K. (Hess) Johnson; died 20 June 1970, Terre Haute, Indiana. 54 vii. WILLIAM PAUL WATSON, born 18 May 1904, Hutsonville, Crawford County, Illinois; married Marie Newell; died 1 December 1929, Terre Haute, Indiana. + 55 viii. EUGENE S. WATSON, born 13 May 1906, Illinois; married Mary Kathleen Brooks; died 22 May 1977, Winchester, Randolph County, Indiana. + 56 ix. FREDRICK L. WATSON, born 20 February 1908, Illinois; married Eleanor Handford; died 19 April 1984, Winchester, Randolph County, Indiana. + 57 x. BYRON SANFORD WATSON, born 29 March 1911, Illinois; married Alice Gregory; died 15 March 1969, Terre Haute, Indiana. 58 xi. JOY LOUISE WATSON, born 22 October 1914, West Terre Haute, Indiana; died 18 February 1915, West Terre Haute, Indiana. Cause of death was acute bronchial pneumonia, aged 3 months 27 days. Joy was buried at Woodlawn Cemetery, Terre Haute, Indiana. Adolphus “Doll” Newton4 Lawhead (Elijah3, John2, James1), born 16 September 1877, Mitchell, Lawrence County, Indiana; died 17 February 1958, Hutsonville, Crawford County, Illinois. He married (1) on 9 April 1901, Crawford County, Illinois, Lana L. Myers, daughter of Francis E. and Sarah J. (Fowler) Myers. She was born circa November 1881, Annapolis, Crawford County, Illinois. Adolphus and Lana divorced before 1907. She married (2) about 1908, Clayborn M. Watt. Adolphus married (2) on 18 April 1907, Crawford County, Illinois, Mary Elizabeth Plew, daughter of James F. and Ellen (Salesbury) Plew. She was born 1876, Illinois; died 1949. Adolphus and Mary were buried at Hutsonville Cemetery, Hutsonville, Crawford County, Illinois. 59 i. SYLVA JO5 LAWHEAD, born 8 Janaury 1901, Robinson, Crawford County, Illinois; married Vernal E. Harrold; died 31 August 1987, Los Angles, California. 60 ii. MARGUERITE LAWHEAD, born circa 1910, Illinois; died 19 November 1973, Robinson, Crawford County, Illinois. “Elijah Griffith Lawhead,” undated clipping, ca. 1911, from unidentified newspaper; Sweeney Family Papers, privately held by Deborah Sweeney, Elk Grove, California, 2016. Crawford County, Illinois, Record of Death, vol. 3 (1910-1914): 110, entry for Elijah G. Lawhead, 28 July 1911. “Indiana Marriages, 1811-2007,” digital image, FamilySearch (http://www.familysearch.org : accessed 25 June 2016), citing Lawrence County marriages, vol. D (1860-1867): 61, Elisha G. Lawhead and Maria McNabb, 13 October 1860. Crawford County, Illinois, Record of Death, vol. 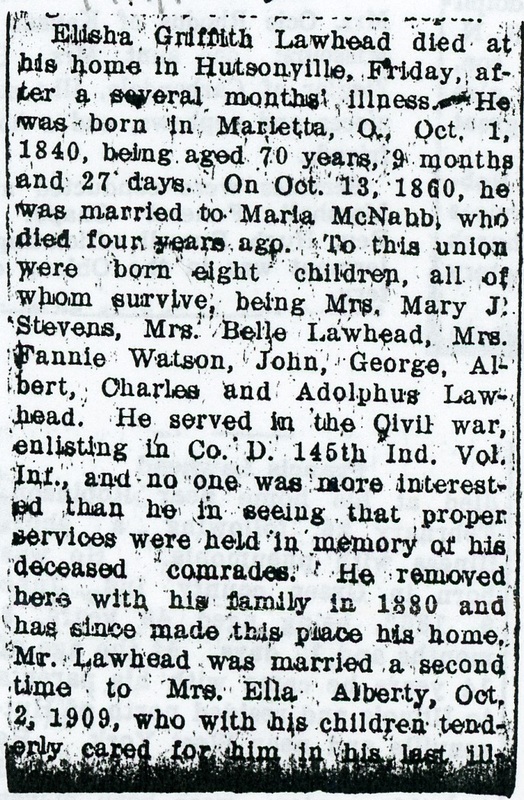 2 (1906-1910): 73, entry for Maria McNabb Lawhead, 21 March 1907; Find A Grave, database and images (http://www.findagrave.com : accessed 25 June 2016), memorial page for Mariah McNabb Laughead (1841-1907), Find A Grave Memorial no. 52,800,310, citing Hutsonville Cemetery, Hutsonville, Crawford County, Illinois; the accompanying photograph by Cheryl (#47,285,528) is a clear image of the stone. 1880 U.S. census, Lawrence County, Indiana, population schedule, Marion Township, enumeration district (ED) 5, p. 423 (stamped), p. 35 (penned), dwelling 62, family 62, Alexander Stephens; NARA microfilm publication T9, roll 292; entry for Alzono Stephens crossed out with the notation “dead” written on line. Also, 1880 U.S. census, Lawrence County, Indiana, Marion Township, mortality schedule, enumeration district (ED) 5, p. 1, Alonzo Stephens; FHL microfilm 2,259,486. 1900 U.S. census, Lawrence County, Indiana, population schedule, Marion Township, enumeration district (ED) 68, p. 12, dwelling 233, family 241, Alexander Stevens; NARA microfilm publication T623. “Indiana, Death Certificates, 1899-2011,” digital image, Ancestry.com (http://www.ancestry.com : accessed 27 June 2016), entry for Fredie Stephins, 20 October 1900. “Obituary, Mrs. Belle Lawhead,” dated clipping, 9 January 1947 (penned), from unidentified newspaper; Sweeney Family Papers privately held by Deborah Sweeney, Elk Grove, California, 2016. The obituary states that Belle was the mother of eleven children; two were deceased at the time of her death. Also, U.S. census, Crawford County, Illinois, population schedule, Robinson City, enumeration district (ED) 47, sheet 19-B, dwelling 279, family 283, James F. Lawhead; NARA microfilm T623, roll 295. Under the “number of children” column, Belle was the mother of eight children, seven living. Find A Grave, database and images (http://www.findagrave.com : 28 June 2016), memorial page for Alma Lawhead (1894-1895), Find A Grave memorial no. 52,800,250, citing Hutsonville Cemetery, Hutsonville, Crawford County, Illinois; the accompanying photograph by Cheryl (#47,285,528) is a clear image of the stone. Crawford County, Illinois, Record of Death, vol. 1 (1877-1905): 225, entry for Edith G. Lawhead, 20 February 1902. Also, Find A Grave, database and images (http://www.findagrave.com : 28 June 2016), memorial page for Edith G. Lawhead (1898-1902), Find A Grave memorial no. 52,800,257, citing Hutsonville Cemetery, Hutsonville, Crawford County, Illinois; the accompanying photograph by Cheryl (#47,285,528) is a clear image of the stone. “Indiana, Birth Certificates, 1907-1940,” digital image, Ancestry.com (http://www.ancestry.com : accessed 29 June 2016), entry for Joy Louise Watson, 22 October 1914. “Indiana, Death Certificates, 1899-2011,” digital image, Ancestry.com (http://www.ancestry.com : accessed 29 June 2016), entry for Joy Louise Watson, 18 February 1915. Also, Find A Grave, database and images (http://www.findagrave.com : accessed 29 June 2016), memorial page for Joy Louise Watson (1914-1915), Find A Grave memorial no. 33,554,403, citing Woodlawn Cemetery, Terre Haute, Vigo County, Indiana. This entry was posted in Genealogy, Lawhead, Lineage and tagged Elijah Griffith Laughead, family history, family lineage, genealogy, genetic genealogy on June 29, 2016 by Deborah Sweeney.